Like "Catholic Faith Formation" on FB for great Catechetical Resources and Inspiration! We are all called by God to be saints. Every year, I strive to teach the children in my parish third grade religious education class that they are included in that call. I explain that the saints were not perfect; they were regular people who sometimes messed up. 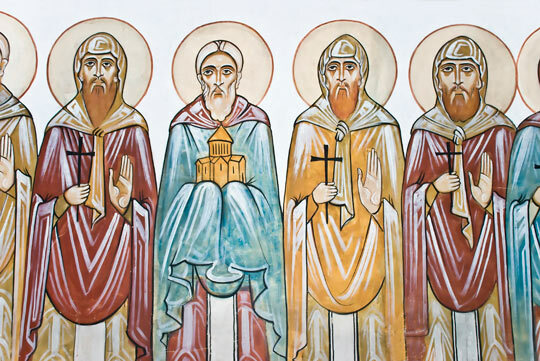 The difference is that saints changed their lives to live as disciples of Jesus. The saintsare examples for us in how to follow Christ. That’s a tall order to get across to eight-year-olds in just one hour. When preparing my lesson about the saints, I first make my list of teaching objectives for the class. We are all called to be a saint. Mary was the greatest saint. The lives of saints are real examples of following Christ. In addition to the chapter in my parish textbook, I prepare several activities, usually more than I will have time to cover in the hour. This allows me to pick and choose which activities best engage the kids in the lesson. For one of the activities this year, I gave the kids time to read about a saint of their choice. I provided, both from my personal library and from the parish, a table full of small books about the lives of different saints. Each student chose one book to read. Some of them knew right away which book they wanted, while others flipped through several before finding a saint that interested them. I handed out a worksheet that the kids could take home with them to help them focus on the life of their chosen saint. The worksheet asked for information such as the saint’s name and birthplace, when the saint lived, what the saint is remembered for, the saint’s feast day, and how the saint is a patron. Some kids wrote out their answers, others just read quietly, and others wanted to talk about their saint. I was surprised at how much this research activity engaged them. What didn’t surprise me were their questions. Third graders are always full of questions, which I love! Spontaneous Q&A can be one of the best teaching opportunities because the kids are truly interested in learning the answers to their questions. One of their questions was about feast days and which feast day was on their birthday. Thankfully, I had a calendar with the feast days on it. The kids were excited to learn about the saint whose feast day was celebrated on the same day as their birthday. Next year I’ll come into class with that information already prepared for each student. Did I get through all my lesson objectives in 60 minutes of class? We did hit on each of them before the end of class by working through the textbook, the activities, and discussion. I pray that the kids are inspired to learn more about the saints, and I hope they remember that it is entirely possible for them to be a saint also! This is more important than just covering the material in a book.